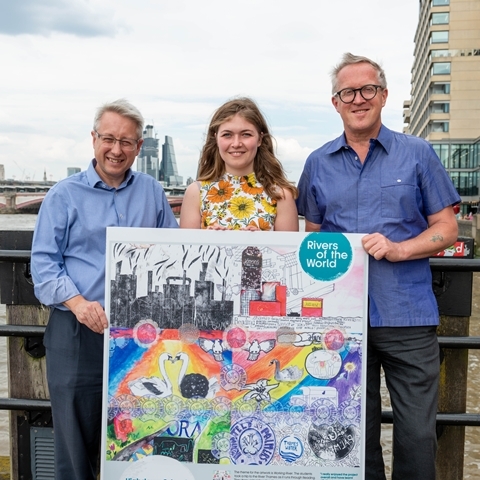 A new partnership between the Port of London Authority (PLA) and the Thames Festival Trust (TFT) will champion river activity and encourage young people to think differently about the Thames. By becoming a core supporter of TFT over the next four years, the PLA will boost the annual month-long Totally Thames celebration of the river (a highlight in the annual river calendar); and support the extension of the Trust’s education outreach work with hundreds of secondary school pupils in London boroughs. Arts Council England, the British Council and the Mayor of London are TFT’s other core supporters. The latest development will help deliver the goals of the Thames Vision, the 20-year development framework for the river’s future, which was developed by the PLA with stakeholders and launched in 2016. ‘Rivers of the World’ - an art-based education outreach project. Each year this involves over 300 secondary school students from different London boroughs, producing river-based artwork, working in collaboration with professional artists. Adrian Evans, director of the Thames Festival Trust, says: “The Thames can get taken for granted. It is the reason London was born in the first place and it plays a vital role in our society – as a main transport channel for bringing in everyday goods; as an employer and tourist attraction boosting the economy; and as a cultural centre. This partnership is an amazing endorsement of the work of the TFT. It enables us to meet our goal of increasing the appreciation of the river and its importance to us all through creating and promoting river-related art, education and heritage programmes. PLA Thames Vision director, Alistair Gale says: “The aim of the Thames Vision is to see as many people connect with the river as possible, whether for work, sport or leisure. Partnering with the Thames Festival Trust on Totally Thames and its education work will help both to inspire interest in the Thames for the first time and to re-energise those with a forgotten love of the river. The Thames Festival Trust is an arts organisation which delivers festivals, stand-alone commissions, river-based events, heritage projects and education programmes. They have a twenty-one year track record of using learning, culture and creativity to amaze, excite and inform. Their work helps bring communities together, originally around the River Thames, and now in cities across the UK and the world. Rivers of the World is a Thames Festival Trust project delivered in partnership with the British Council. The project has worked with 30,000 12-14 year olds across the UK and in 30 countries around the world to inspire young people about rivers through art and creativity.